Home » Recipes » Battle of the Food Network Breasts!! I can already tell you who the winner is. 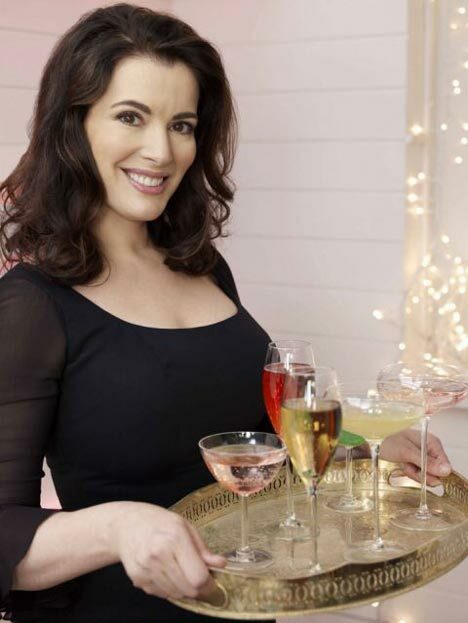 If we are going on looks alone Nigella Lawson (my new idol) wins hands down. Her dark good looks, naturally round and curvy figure, smooth skin, and bright eyes would be enough to draw you in. Add to this a sparkling wit and a true love of cooking, not the short-cut-whack-a-dough-put-an-extract-in-a-box-of-cake-mix that Sandra Lee peddles, and you have someone that could save the Food Network! Lets compare the two, shall we, just for fun! Now, let us explore Sandra Lee. Sandra’s philosophy of cooking is 70% store-bought/ready-made and 30% fresh ingredients and creative touches. So, to be clear, all the food can be store bought as long as 30% of how you present it is homemade and it would still be considered Semi-homemade. Ok. Many months ago, before I began culinary school, I prepared the infamous (among my fellow shrikes at Television without Pity) Apple Pie Crapoleon. You can see the pictures to see how that came out. I do not think you will be shocked. Her comments during her show always include some reference to how professional the food will look. Appearance is very important to Sandra. There is nothing wrong wanting to present food that looks appealing, but why sacrifice taste and nutrition for corner cutting that, truth be told, does not make your life any easier and does not even look better than something you took your time to make from fresh ingredients? Every show has a theme with coordinating kitchen and tablescapes. (In recent episodes it has also included a recipe box decorated to match the theme of the episode. Her cards even have decorations like ribbons! How practical!) Decorating is fine, but she goes to a level of extreme where you did not know it could be so extreme! With all the time you are ‘saving’ making her ‘food’ you can decorate your home for each meal. Sandra loves to pass off store-bought food as her own cooking. Why? If you are so darn proud of your 70/30 lifestyle why pretend!? I can’t even begin to describe the things she has stuffed INto Angel Food Cake holes. Why should good taste and enjoyment of cooking suffer because our society has become so time obsessed that we can’t spare half an hour to make a fresh meal? I am not talking about fancy food either, something as simple as a pot of soup or a skillet of eggs can make a difference in your outlook on the day and your overall health. Let’s face it, fast food and pre-cook foods in the grocery store are not your best nutritional choices. Maybe, I am not supposed to get it, or, maybe I don’t get it because I do get that cooking can be a joy. True, I have taken a short cut now and again. Who hasn’t? But, I have NEVER pawned off something I bought as my own work. First, I would not want to because it is never as good as homemade, and second because I am not that kind of hostess. So, as of today I shall continue to fight agains the evils of the 70/30 Queen of SLop and promote the lovely and talented Nigella. Balance, in all things, is good.